Of all the things you have to worry about, you may not even think about the dangers lurking in your——shampoo? It may have many harmful ingredients that you need to avoid. In theory, you should have more concern over what you put in your body. Still, topical beauty products can prove unsafe, and an extensive report made public by the FDA proves the problem. Recently, the FDA released information on adverse reports related to food and beauty products. This data came from the Center for Food Safety and Applied Nutrition and is extensive since it goes back to 2004. It provides a good basis to further research on the health effects of beauty supplies. While the FDA and beauty companies figure out how to combat this problem, you should learn to recognize and avoid the worst ingredients in beauty products. Look at this list to get started and do your own background research on your favorite brands. This ingredient is well-known as a skin, eye, mouth, and even lung irritant, making the product hard on people with sensitive skin. In addition, sodium laureth sulfate may contain a chemical known to cause cancer in laboratory mice. Researchers have not found a direct link to cancer in people. Believe it or not, many haircare and other household products use this preservative ingredient. Studies have shown an inconsistency with a link to cancer, although a more consistent link exists with topical applications on mice. Beauty companies often use parabens to protect against bacterial growth. However, the chemical mimics estrogen in the body and can cause cancer cells to grow more quickly. For now, the FDA has not found a strong enough link to ban the ingredient. In general, staying away from a chemical that may mess with hormones is a good idea, though. While ingredients in food get at least some regulation, beauty products have much free reign. If an ingredient does not have a direct link to disease, beauty companies may just be using it. However, researchers have found harmful results in studies on chemicals commonly used in beauty products. 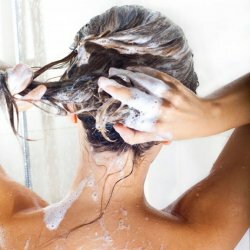 To protect yourself, you should consider researching the chemicals used in your favorite beauty supplies, including your shampoo.